At at fast 115 pages, you can read this book in a sitting. Looking back, it would make more sense for a beginner to read this and then Firm Commitment (the last entry). 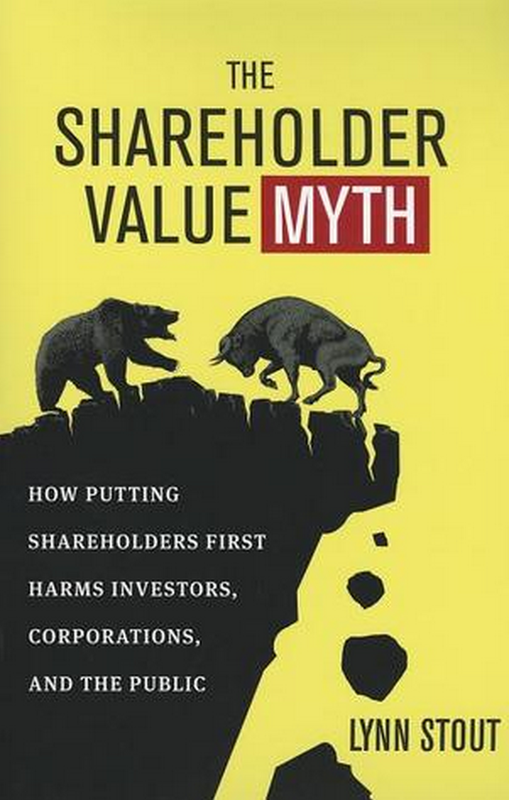 Professor Lynn Stout’s view here seems to be that what’s actually in shareholders’ interest is different than what we typically think of and we actually harm them through the current conceptualization of what is in their interest (i.e. “maximization of stock value”). In short, they’re people with lots of different interests that include more than just stock-price maximization. So, we should expand our understanding of what “shareholder value” means, if we are going to actually benefit them. Some of the examples she uses to make her points I don’t get. For instance, to illustrate her argument that something that might help a shareholder qua shareholder could end up hurting him along another dimension. Here she asks the reader to imagine a shareholder in Microsoft. Their stock price might shoot up if Microsoft knocks out all competitors and become a monopoly (which is good for the shareholder qua shareholder), but if the shareholder also buys software as a consumer, he’s also forced to pay monopoly pricing, which hurts. I get the idea but… I’m guessing the average person who is both a shareholder and consumer of Microsoft nets a lot more financial benefit from the upward stock price, even after paying a bit more on the consumer side. By a lot. Another oddity — “Goldman Sachs investment bankers and Morgan Stanley traders can easily take their skills and their client relationships to other banks, and often do, and at least in the United States, any attempt to stop them would run afoul of the U.S. Constitution’s Thirteenth Amendment.” (pp. 84-85). I don’t know if she’s trying to suggest non-competes are unconstitutional? Anyway, a nice intro read (also a plus are the helpful footnotes) but at least for purposes of this project she takes as a premise that shareholder value can be the lodestar, it’s just we need a robuster version of it. This entry was posted in Book Reviews and tagged academica, bibliophilia, Book Reviews on January 26, 2015 by heathermichellewhitney.